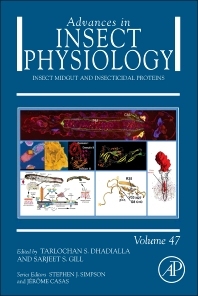 This volume of Advances in Insect Physiology contains comprehensive interdisciplinary reviews on basic and practical aspects relevant to Insect Midgut and Insecticidal Proteins. Sarjeet S. Gill is Professor of Cell Biology in the Department of Cell Biology and Neuroscience at the University of California, Riverside, and Entomologist in the Agricultural Experimental Station on the same campus. His research interests are in biochemistry, molecular biology and insect toxicology, with a focus on mechanisms of bacterial and viral pathogenesis, and the role of the midgut and Malpighian tubules in insect homeostasis. Dr. Gill's research also employs the use of whole genome tools to analyze gene function. His research has been continually funded through the NIH and USDA, he continues to serve on national and international committees related to his research interests, and is an elected fellow of the American Association for the Advancement of Science.